From left to right: Farouk Hemral, CEO and Co-Founder Distree Events, Mohamed Cassim, CEO of Esquire Technologies. Esquire Technologies has scored a first for a South African ICT distribution company by winning two awards - the African Distributor of the Year Awards and the 2013 EMEA Channel Awards title and the premier Distributor Initiative of the Year Award. The Distributor Initiative of the Year Award is the top award at the annual EMEA Channel Awards. Esquire Technologies, the lifestyle-focused ICT distributor, clinched the two awards at this year's 2013 EMEA Channel Academy Awards, held at a gala event in Monte Carlo on 22 February. The prestigious event was attended by over 1 000 senior executives from vendors, distributors, retailers and e-tailers operating in the Europe, Middle East and Africa (EMEA) region. This is the second year in succession that Esquire has walked away with top honours. 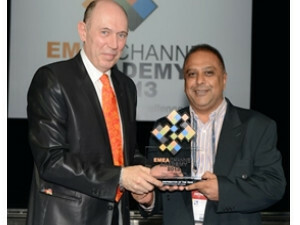 Last year, it also clinched the EMEA Channel Awards Distributor of the Year Award (2012). The EMEA Channel Academy Awards were established by DISTREE EMEA, an event that has become the largest annual gathering of senior executives from vendors, volume distributors, retailers and e-tailers working in EMEA's information and communications technologies (ICT) and consumer electronics (CE) channel. Speaking at the event, Farouk Hemraj, CEO and Co-Founder at DISTREE Events, said: "We are delighted to host the 'EMEA Channel Academy: 2013 Awards' as part of this year's DISTREE EMEA. These awards stand out in the region for their independence and neutrality. With live electronic voting and transparent nomination processes, these awards truly recognise the companies that have excelled in the channel during the last 12 months." 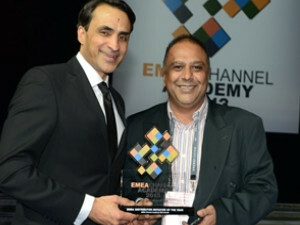 The 'EMEA Channel Academy: 2013 Awards' featured 10 regional distributor awards for territories that included the UK and Ireland, DACH, France and Benelux, Northern Europe, Southern Europe, South East Europe, Middle East and North Africa, Africa, Central and Eastern Europe, and Russia and CIS. For the Channel Academy EMEA Distributor Initiative of the Year Award, the panel looked for criteria that included a new financing approach through to an incredible bundling promotion, loyalty scheme, logistics improvement or increase in reseller breadth. Hemraj said the organisers were looking for an initiative that "has made a significant impact on a distribution business and has been recognised by the wider channel community". Nominations were submitted by distributors from the IT and CE kit in Europe, the Middle East, Africa, Russia and CIS for this year's event. From left to right: Frederic Simard, Managing Partner Distree Events, Mohamed Cassim, CEO of Esquire Technologies. The EMEA Distributor Initiative award was judged on a number of criteria, including: conception, innovation, creativity, sales performance, impact on margin, reseller engagement, vendor involvement and overall market impact. This award is widely recognised as a benchmark for channel excellence in the region. Esquire won this award for its Xpress store concept and its world-first Virtual Reseller Network, as well as the iBonga Rewards by giving back to the resellers. Said Mahomed Cassim, CEO of Esquire Technologies: "We are overjoyed to win this prestigious title for a second year in a row - and to bring home two this year. "We revere these awards and see them as among the most important we have won over the past few years - and winning the Distributor of the Year Award for a second year in a row is particularly spectacular for us. "Winning these awards is certainly no mean feat," said Cassim, "and it places us firmly on the international and African maps, as a leading ICT distributor. We are also the first South African IT distribution company to win two awards in a single year. "We are pleased to bring this award back home to South Africa and it will serve to galvanise us further to bring innovative products and solutions to the marketplace and to our resellers. "We also believe that we, as a company, would not have been able to win this award without a dedicated management team and a dedicated pool of employees. We dedicate this award to them."